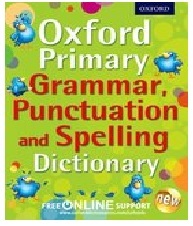 Aimed at the 7-11 age learning grammar, punctuation and spelling rules with a 62 page dictionary combined at the back. The dictionary element also contains boxed tips on the common errors made. This is an Oxford Primary Dictionary with so much more valuable content. The introduction says the pages are designed to make it easy and fun to use. Terms and rules explained in simple ways and help on how to avoid the most common errors. And that is exactly what it does in a good format for children to use alone or sharing at a table, or most likely, for the teacher to use with them or via whiteboards. Colour coded sections for Grammar, Punctuation and Spelling. Explanations, examples all clearly given and easily understood. The spelling section leads the reader on beautifully from vowel sounds to spelling rules….. and exceptions……., prefixes,correct use of apostrophes, homophones and homographs and different spelling groups, not forgetting suffixes…. In fact I have missed out several parts of the contents of this book but I am sure Oxford University Press havent. Praise should go to the publishers for such a clearly informative book offering a touch of lightness for children and teachers who now need to get a full grip on these basics of English language. You start at the top of the page and scroll down to ‘free dictionary resources’ and then ‘childrens primary’ to click and scroll to the image of the book. Resources are specific to the book but many are available on this site to cover other books in their range. The publishers thank the primary teachers and schools, educational consultants and grammarians involved in compiling the book. To create something that is so ‘usable’ via so many hands is also a credit to the editor involved at O.U.P. You dont have to be young or a teacher to use to use this book. Any age in need of boosting their knowledge of grammar and spelling should take advantage of it. Whether in learning English as a new language, a writer wishing to keep on top of the game (rather than breaking the rules) or just refreshing a mind that has forgotten or never really knew. Here you can easily understand the difference between the colon and semi-colon which, with the apostrophe seem to be major stumbling blocks. (In case you ask, I am in favour of saving the semi-colon). Well, I have no excuses now!